It might be the year-end trading lull but there remains plenty of opportunities for investors to make and lose money. While oil and copper are trading at multi-year highs, commodity-related stocks still experienced some volatile swings. 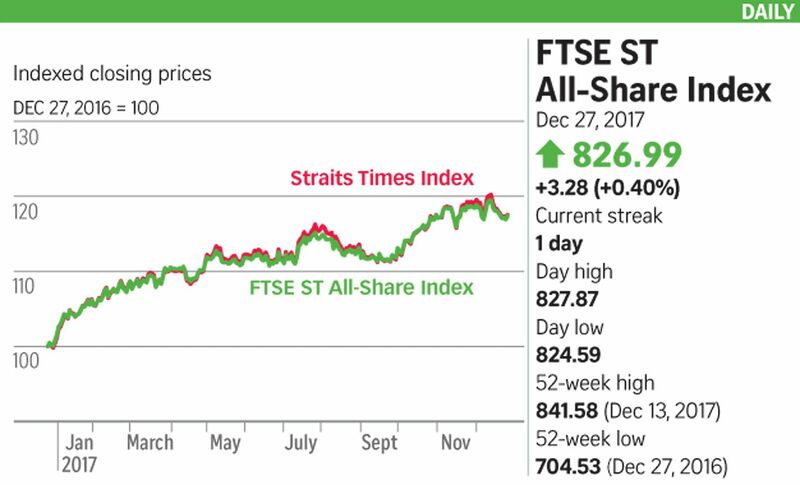 Gains in DBS Group Holdings and United Overseas Bank did the heavy lifting for the benchmark Straits Times Index yesterday, pushing it up 13.51 points to 3,391.67, with about 1.25 billion shares worth $616.6 million changing hands. At $24.88, DBS is approaching its 52-week intraday high of $25.36 hit earlier this month. Investors continue to like the economic growth story, which benefits banks in their wealth management segment as well as rising net interest margins. Cosco Shipping International (Singapore), involved in a buyout of logistics firm Cogent Holdings, also rebounded after a month-long decline. It closed at 38.5 cents, up 2.5 cents or 6.9 per cent. Meanwhile, active oil-linked stocks included explorer Rex International, support vessel providers Vallianz and Falcon Energy, precision engineer GSS Energy and engineering firm Ausgroup. After falling on Tuesday due to a hefty fine in relation to a corruption probe, conglomerate Keppel Corporation recovered three cents to $7.32. Counterpart Sembcorp Marine fell a cent to $1.86. Maintaining its "buy" call, Deutsche Bank said the resolution of the matter allows Keppel to bid more confidently for upcoming projects in Brazil. "It would be of interest for Sembcorp Marine to seek a quick resolution if they are implicated," it added. Its target price for KepCorp was reduced from $8.60 to $8.10, while it trimmed its target price for SembMarine from $2.60 to $2.40. In the pennies, Henan-based chemical manufacturer Jiutian Chemical Group is rising again after declining about 35 per cent from a mid-November peak. Jiutian went up 0.5 cent to 6.5 cents. The firm has reported a turnaround in fortunes this year with higher sales and prices of its two main products. Alliance Mineral Assets rose 6.8 per cent to 39 cents, a two-month high. Gold miner Anchor Resources and phosphate miner AsiaPhos were also active. Aluminium extruder Midas Holdings, which had tanked recently on outlook and debt concerns, rose 5.8 per cent to 11 cents. In the region, Indian stocks hit new highs as investors bet on continued reforms and economic growth. Chinese stocks are having an uninspiring year relative to other indices in Asia. Shanghai shares fell 30 points to around 3,276.